Here is an olive green version in my Carbon series. I called this one "Emerald" mainly because of it's elegance. UPDATED 7.31.05 ~ Made some changes to the menus and fixed the black text in IE bug. Thanx... I recolored Sapphire first just to see what it would look like in this color. After seethe beauty of it I had to write it from the ground up. So if you notice it has it's own personality. I have done some skins in the past that came in a couple different colors but they were not quite the same quality. They also seemed to perform more slowly. I also am working on a metallic blue version of Industrialized right now. Not much to say except...perfect. Thanx guys... if you find something isn't quite right please let me know and i'll work on it right away. Try incorporating the carbon fiber a bit more into the skin...just a thought...Nice job! This is sweet! You did a great job. 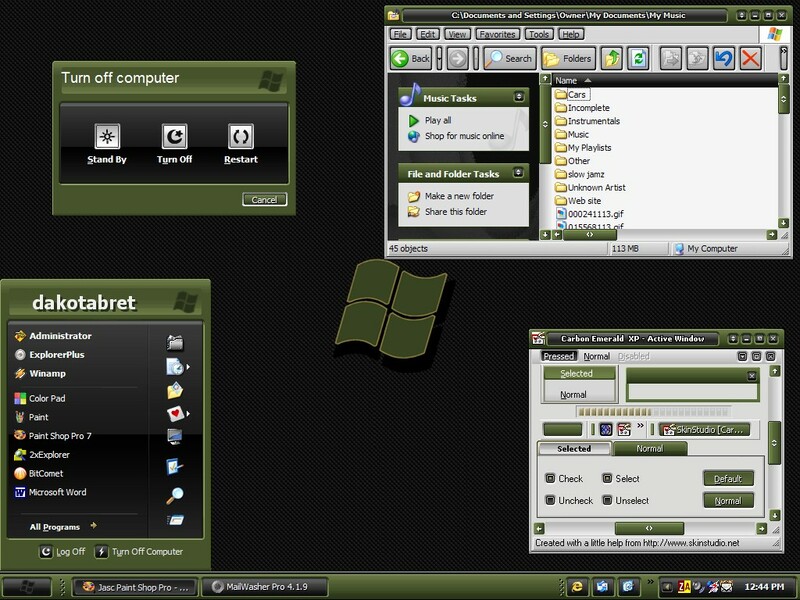 Any future plans to add the transparency that the latest Vista screenshots are showing? Oops...clicked on the wrong link...SORRY! But the skin is still sweet! I love this and the saphire skin! They are my two favorite skins. I think it would be great if you added one that was silver and black to your series and call it Carbon Chrome XP or something... just a suggestion. Well.. I recently submitted a skin called "Industrialized" that had a dark scheme to it. I really didn't think about it with this skin. I will consider it though. Thanks for the comments. Great skin dakotabret! I really love the green. It goes great with the black bars and Start Button. This skin is super easy on the eyes, nice color transitions. Any thoughs of doing a matching ObjectDock background? I love It! !Using it now,But where's the wallpaper?